In the dusty heat of twin-sunned Tatooine lives the wealthiest gangster in a hundred worlds, master of a vast crime empire and keeper of a vicious, flesh-eating monster for entertainment (and disposal of his enemies). Bloated and sinister, Jabba the Hutt might have made a good joke -- if he weren't so dangerous. 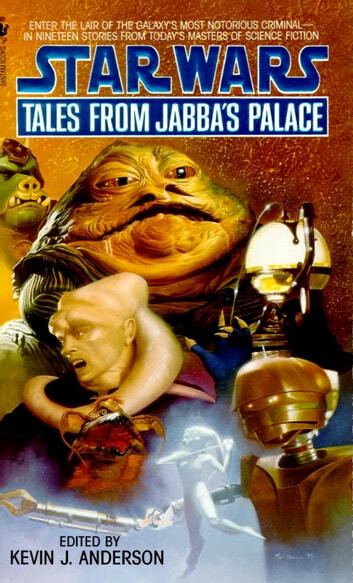 A cast of soldiers, spies, assassins, scoundrels, bounty hunters, and pleasure seekers have come to his palace, and every visitor to Jabba's grand abode has a story. Some of them may even live to tell it. . . . Featuring original stories by: Kevin J. Anderson, M. Shayne Bell, John Gregory Betancourt, Mark Budz and Marina Fitch, A.C. Crispin, Dan'l Danehy-Oakes, George Alec Effinger, Kenneth C. Flint, Esther Friesner, Barbara Hambly, Daryl F. Mallett, J.D. Montgomery, Judy and Gar Reeves-Stevens, Jennifer Roberson, Kathy Tyers, Deborah Wheeler, Dave Wolverton, William F. Wu, Timothy Zahn.